Isn’t it time you got out to your lawn and start pitching some balls to your kid to spend some quality parent-child time? 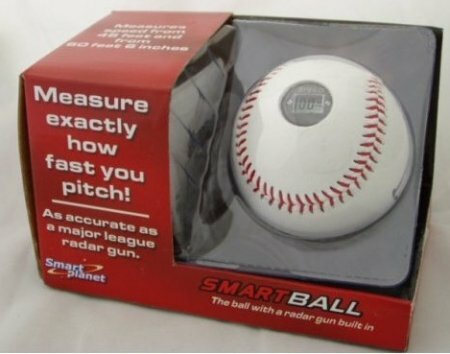 Why not do so with the Baseball with Built-in Radar Gun – this is one high-tech ball that will help you strive to do your best always since it comes with an integrated radar gun that is able to tell just how fast your last throw was, maxing out at 120mph. Of course, if you happen to throw past that limit regularly, we’d strongly suggest you go for your state team’s tryouts as any team would definitely be able to make do with another starter. One word of caution though – don’t bother hitting this ball with a bat, otherwise all of the electronics inside would screw up. THIS IS SOOOOOOO OLD!!!! get up to date and don’t post crap thats been around for over 20 years.